HONG KONG, June 8, 2018 - (Media OutReach) - FrieslandCampina (Hong Kong) Limited (FCHK) is named the winner of 'Social Empowerment' and 'Health Promotion', two categories at the 10th Asia Responsible Enterprise Awards (AREA) 2018. These awards recognised the significant achievement of two leading programmes, 'New Generation Milk Tea Master Training Programme' and 'OPTIMEL(R) Feel Young in the Inside Health Promotion Campaign'. Recognising that the company's success comes from the community and consumers, FCHK continues to give back by leveraging its dairy heritage and expertise. On one hand, FCHK and its brand BLACK & WHITE(R) have been leading the development of the Hong Kong-style milk tea for over 75 years; and are committed to promoting and preserving the Hong Kong-style milk tea making technique, an Intangible Cultural Heritage of Hong Kong. FCHK formed a public-private partnership with social service organisations and renowned chain restaurant groups to host the second New Generation Milk Tea Master Training Programme, a unique community empowerment and cultural sustainability programme that provided training for unemployed individuals with basic local teashop bartending skills, equip trainees with vocational skills and introduce new blood into the industry. FCHK also extend the Programme secondary school students to ensure the preservation of the cultural heritage will get passed on to the next generation. Meanwhile, FCHK has remained committed to nourishing the lives of Hong Kong people across all ages. FCHK and its brand OPTIMEL(R) organised 'Feel Young in the Inside Health Promotion Campaign' to educate local adults and senior about essential nutrition needs and importance of physical activities through online tools and offline event. FCHK collaborated with NGOs, nurses, nutritionists, physiotherapists, fitness coaches, Tai Chi Masters and Brain Gym instructors to visit a total of 88 elderly centres and elderly homes to host health seminar and conducted health tests. A series of interactive online health assessments were developed to empower adults and seniors to review their own diet, physical activity habits and lifestyle. The programme created direct experiences to promote balanced dietary choices and regular exercise and provided locals with needed nutrition. AREA honour Asian businesses for championing sustainable and responsible business practices, demonstrating companies' leadership, sincerity and on-going commitment in incorporating responsible and ethical values, compliance, investment in stakeholders, involvement in communities and protection of the environment into the way they run their businesses. This year, over 200 submissions from 14 countries were received across Asia, while 'New Generation Milk Tea Master Training Programme' and 'OPTIMEL(R) Feel Young in the Inside Health Promotion Campaign' were recognised as one of the most outstanding and impactful Social Empowerment and Health Promotion cases over the last year. FrieslandCampina (Hong Kong) Limited (FCHK), a subsidiary of Royal FrieslandCampina, has maintained a long presence in Hong Kong since 1938. In the past 80 years, FCHK has been providing high quality and nutritious dairy products including FRISO(R) mother, infant and toddler milk formula, DUTCH LADY(R) dairy based beverages, OPTIMEL(R) adult nutrition formula and dairy products including BLACK & WHITE(R) and LONGEVITY(R), nourishing the lives of Hong Kong people across all ages. FCHK has developed a wide network in both retail and business channels with our products being available at key chain drug stores, supermarkets and open trade, as well as being the supplier-of-choice to top tier food chains, teashops, restaurants and hotels. Currently, our business covers Hong Kong and Macau. Every day FrieslandCampina provides millions of consumers all over the world with food that is rich in valuable nutrients. FrieslandCampina is one of the world's largest dairy companies, manufacturing and providing a variety of dairy products which serve as raw materials and semi-manufactured goods for global infant and toddler products, the food and beverage as well as medical industries. FrieslandCampina has offices in 34 countries and employs a total of about 23,000 people. FrieslandCampina's products find their way to more than 100 countries. The Company's central office is in Amersfoort. The Company is fully owned by Zuivelcooperatie FrieslandCampina U.A, with about 19,000 member dairy farmers in the Netherlands, Germany and Belgium, one of the world's largest dairy cooperatives. For more information please visit: www.frieslandcampina.com. The Asia Responsible Enterprise Awards were organised by Enterprise Asia, a non-governmental organization in pursuit of creating an Asia that is rich in entrepreneurship as an engine towards sustainable and progressive economic and social development within a world of economic equality. AREA was launched in 2009 to recognise and honour Asian businesses for championing sustainable and responsible entrepreneurship in Green Leadership, Investment in People, Health Promotion, Social Empowerment, SME CSR and Responsible Business Leadership. The Asia Responsible Enterprise Awards are opened to all organisations in Asia. Award judges include many of the world's most respected executives, entrepreneurs, innovators, and business educators. 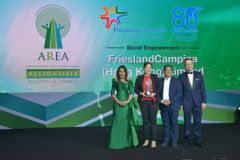 FrieslandCampina Hong Kong is named the winner of 'Social Empowerment' and 'Health Promotion', two categories at the Asia Responsible Enterprise Awards 2018.